I know is too soon for think in this, but could be something good give some ideas considerable for the future, I mean, exist a lot of kaijus for choose who could be great enemies, bosses, even playable characters, but of course i dont want to present some problem trying to accelerate the work of the game, i really dont want that, but i think a good character for the game could be The God Warrior from Nausicaa, with a incredible power, intimidating appearance and a history who leave you free to the imagination for their true origin (probably alien) it could be a great boss in my opinion. Also, this isn’t one of the most remembered creatures, but it really is one of the greatest if you ask me. 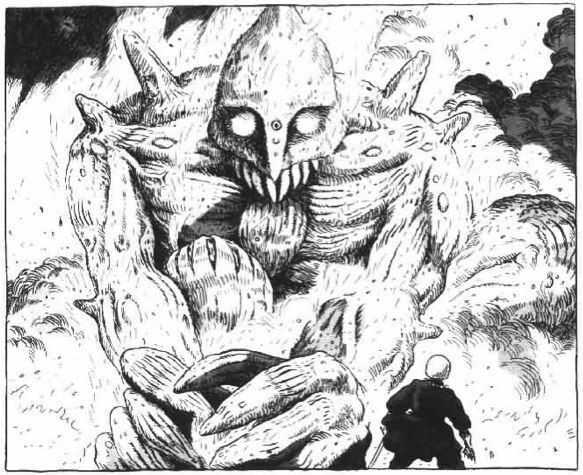 This is the official form in the manga of Nausicaa. And this is a more detailed image of its fisical form. I'm not too sure Psyke would be adding something like this into the game, as currently the only new kaiju (that I'm aware of) are new variations of enemies from the original game; Matango and Dogora. The GH1D0RAH world is very likely to have new enemies, but they'll most likely be glitched versions of pre-existing kaiju and enemies. I don't know for definite though. Maybe as a secret boss of some kind, but other than that very slim chance I'm doubting this idea will make it into the game. Which might be for the better in honesty; the game is already such a huge project. I know is a weird character, and put him in the game could be wrong, but it’s just an idea, I don’t want to ruin the game with a character who simply don’t fit in it, but I was thinking in how he could look like a sprite, how he move and how he attack, that’s the true reason why I think the God Warrior could be a good character, but of course, if the character don’t work it could be a good inspiration for another character, with a design like this. 2 - Add monsters/enemies that already have their sprite on the web (with the permission of the author of course). The only idea I had for a "GH1D0RAH" enemy was maybe a glitched amalgamation of the game's regular bosses. Sort of like the enemies on Zenith's "KILL" stage, but it'd be like a mess of sprites; something you'd see when a game glitches or corrupts. If that makes sense. If you need help with the pixel art I will try to find someone who can help you, I know that it a slowly process for the sprites, but I think I have been see some pixel arts about the creepypasta, so fear not, because soon you will have some help…. Well at least I will try to find someone, because this project deserve it. (08-25-2017, 11:52 PM)Wackowithwhiteeyes Wrote: If you need help with the pixel art I will try to find someone who can help you, I know that it a slowly process for the sprites, but I think I have been see some pixel arts about the creepypasta, so fear not, because soon you will have some help…. Well at least I will try to find someone, because this project deserve it. I'll try getting a sprite done sometime soon; just to see how well I can sprite this particular kaiju. If Psyke is fine with what I produce, then I'll do my best to sprite-up the rest of the monster's sprites, as well as any other that might be needed. Holy heck it's been a while. College and anxiety got in the way. As for how my sprite attempt went? Well... I drew it from the wrong angle. As in differently from how every other Kaiju is positioned. Just great. Not sure if there's anything I could do about it, other than restart the sprite. But I'm willing to try spriting anything Psyke would be looking for. (09-10-2017, 12:24 AM)Ampharosite Wrote: Holy heck it's been a while. College and anxiety got in the way. As for how my sprite attempt went? Well... I drew it from the wrong angle. As in differently from how every other Kaiju is positioned. Just great. I know 2 people who can do that, (They would need to work together) They go by Jacob Turbo, and Dargon. They have actually done some amazing work on JokasDroid's version of the game, and they are willing to work on sprites for extra monsters. If anyone is interested, I will contact them.